Hiya guys! Just another pollen-filled day here in Jersey. It's definitely not a kind day for my allergies! Nevertheless I have some really beautiful polishes to share with you. 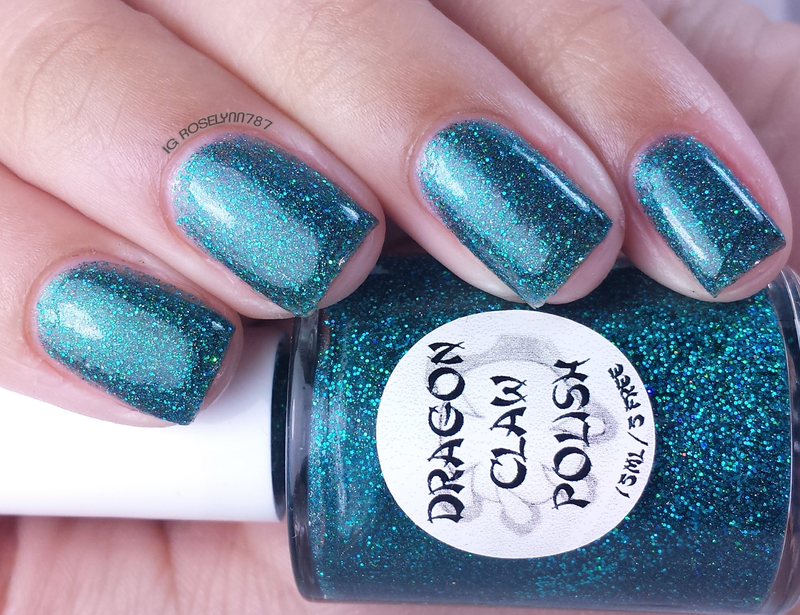 Today I'll be showing you swatches for two of the Holo Palooza Collection Dragon Claw Polish. I had not previously tried this indie so I was really excited when Janet reached out to me, especially when I heard what the collection was about. The four-piece collection is inspired by some of the greatest punk and rock/metal bands: Black Sabbath, White Stripes, Red Hot Chilli Peppers, and Green Day! 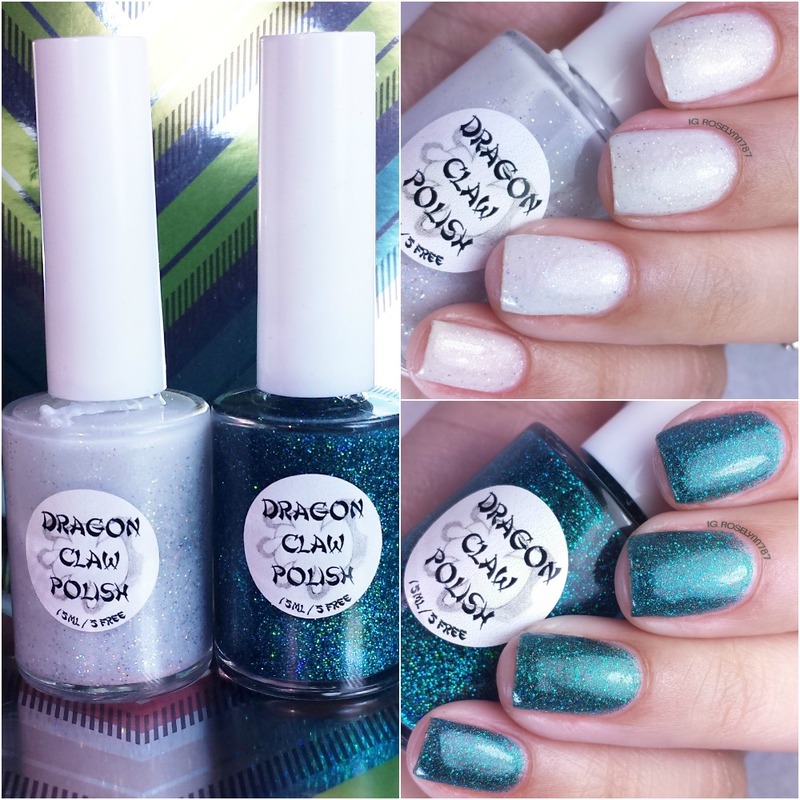 The Holo Palooza Collection by Dragon Claw Polish will be releasing Friday May 8th. The polishes will retail for $7.95 for a full size bottle and only $4.95 per mini. Holo White Stripes is a white holo glitter polish. 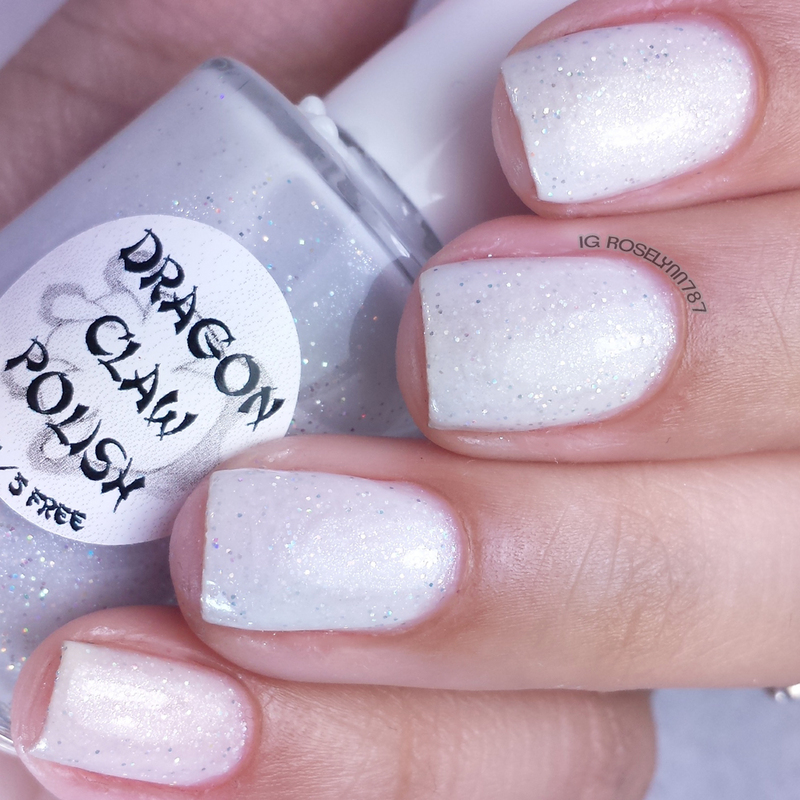 I don't think I have seen a white holo polish before! I was definitely intrigued by the description of the polish before I even had a chance to see it. It ended up being much more beautiful than I could of anticipated! It feels like magical glistening snow on my fingertips. 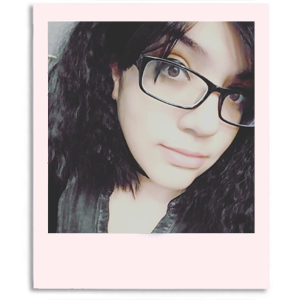 The formula applied smoothly, but I did experience some unevenness with the layers. It's a very sheer polish, which causes some initial patchiness when you're layering. For these swatches, I used three thin coats and sealed with Dragon Claw Topcoat. Holo Green Day is a dark green (hinting at teal) holo glitter polish. I'll give you a minute to stop drooling ladies, haha. Doesn't this have must-have written all over it?! This is such a gorgeous polish and the holo glitters have a real jaw-dropping sparkle (see macro below). The formula and consistency are fantastic, not too thin or too thick. The polish is also very opaque on the first coat, I added the second layer for the sake of formality rather than necessity. For these swatches, I used three thin coats and sealed with Dragon Claw Topcoat. 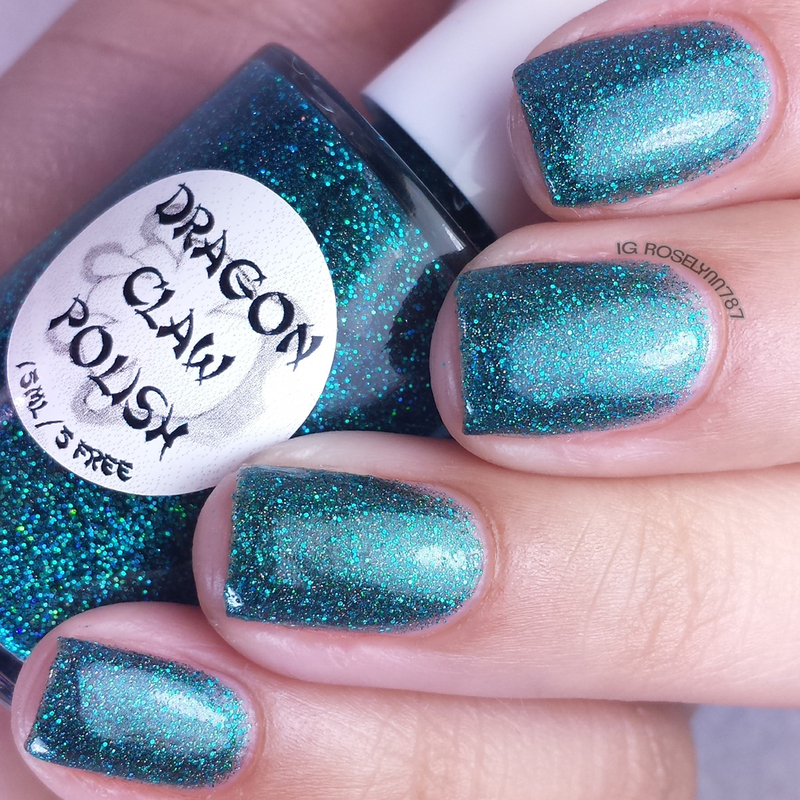 Dragon Claw is a non-yellowing, chip resistant, high gloss, and fast drying topcoat. Both swatches that I reviewed today were sealed in using this topcoat. I also used the polish Dragon Fly Wings (gifted to me from Janet) to showcase the topcoat further. As you can see one photo is shown with and one without topcoat. The polish above dried matte so you can see the glossy definition this topcoat adds to it. The dry time is relatively quick as advertised, I timed a mani completely drying at under two minutes. Definitely impressive and I tested the dry time with a vinyl too. I managed to use the vinyl as intended without pulling off the polish within two-three minutes. The five-free formula also has no more smell than normal polish, which is a huge plus for me personally. As a Seche Vite die-hard fan, I have to say I am impressed with the formula and gloss of this topcoat. I will definitely be ordering myself a full-size and seeing how I like it long-term. Please note: I was not able to test chip resistance as I did not wear a mani with this topcoat lasting longer than two days. Within these two days I did not experience chips, but I am not hard on my hands and nails at all. 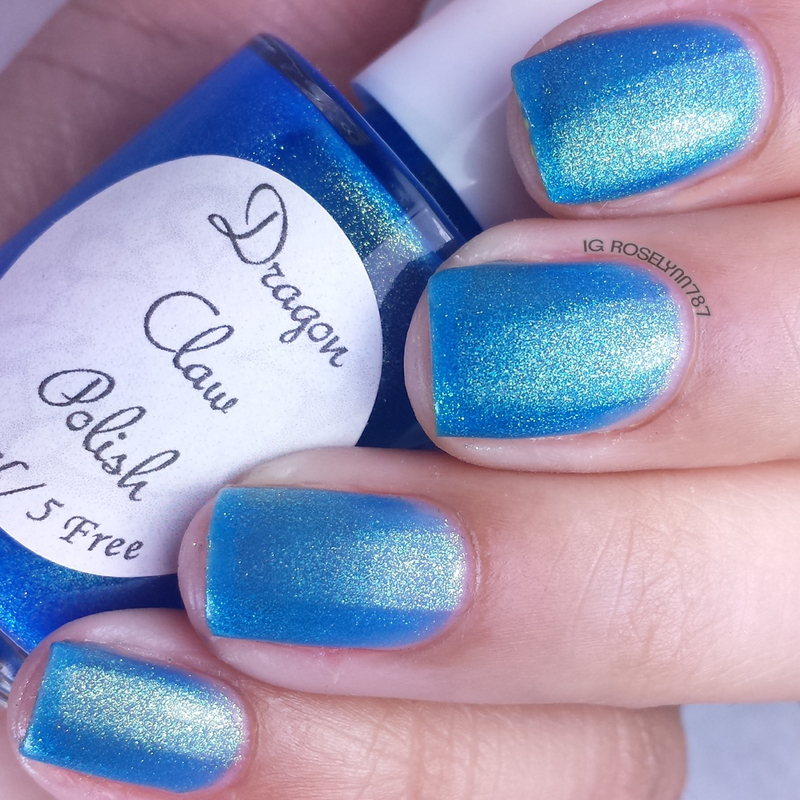 Overall Dragon Claw Polish has made a magnificent first impression on me. The formulas for both polishes were very pleasant to work with. As for Holo Green Day well I definitely recommend any fan of holos or the shade of greenish teal... No, I recommend any polish fan in general to pick this one up, you won't be disappointed! 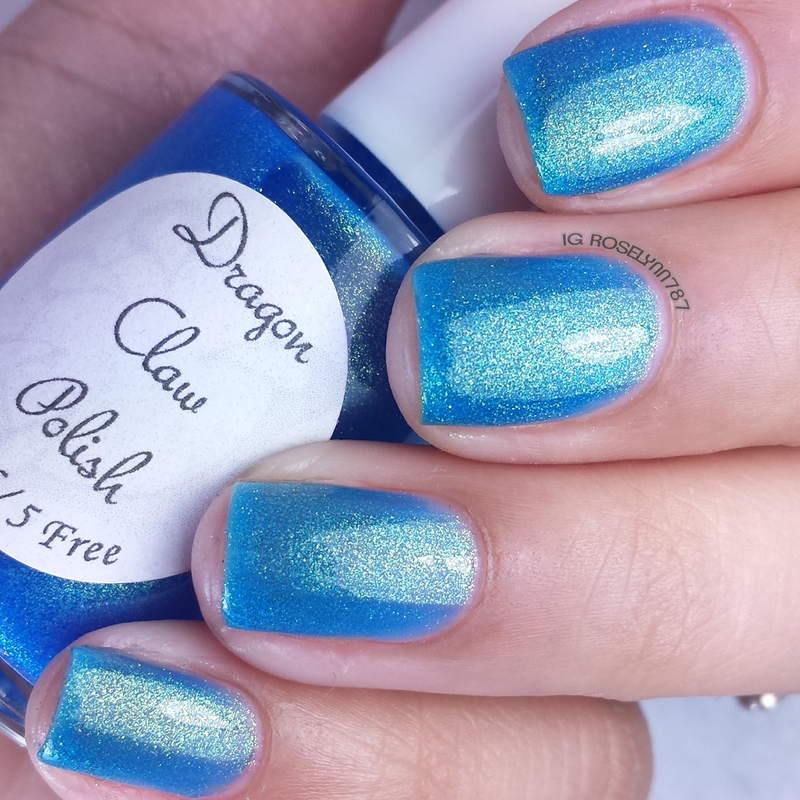 As I mentioned before, the Holo Palooza Collection by Dragon Claw Polish will be releasing Friday May 8th. The polishes will retail for $7.95 for a full size bottle and only $4.95 per mini. Beautiful colors! I'm in love with that white one! Holo Green Day is seriously gorgeous!! I love the names of these and I really am digging the colors. Super pretty! I really like Fly Wings. That is gorgeous and I am so not a blue person! Holo Greed Day is really pretty! Holo white stripes so is so delicate and sparkly. very pretty swatches! 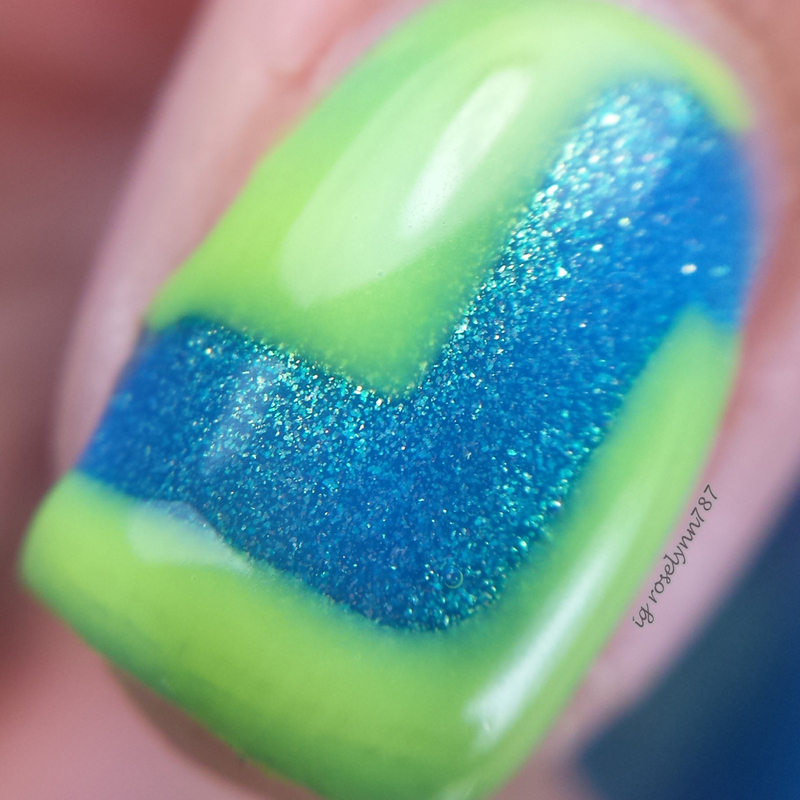 Holo Green Day is so pretty, and stunning macro! 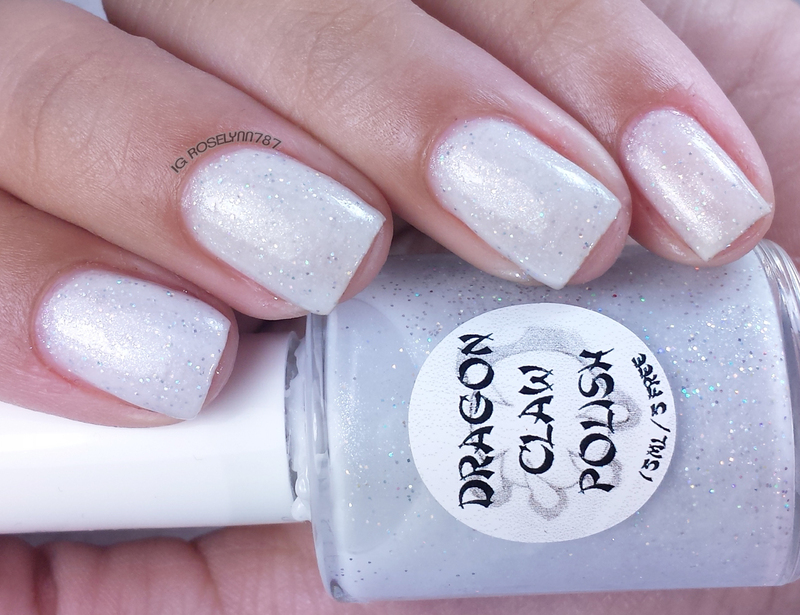 I love holo white stripes, white holos are quite rare! Holo White Stripes is lovely! Okay, so Holo Green Day is UH-MAZING!!! I absolutely love that shade. Lol, YES!! Holo Green Day IS amazing!! I really like Holo White Stripes too, I don't think I've seen many holo whites out there either! Great review! They're all so beautiful! I want the white one! Great swatches - but WOW that white holo! All these polishes are gorgeous. Love your macro shot. Holo Green Day is so gorgeous! The teal is amazing ! Just in love ! Holo Green Day is so cute! That white is so ethereal and delicate and then POW that green! :D Lovely look at both of these polishes. Pretty! That white is so delicate. Holo Green Day has me DROOLING!!!! Just gorgeous!! !